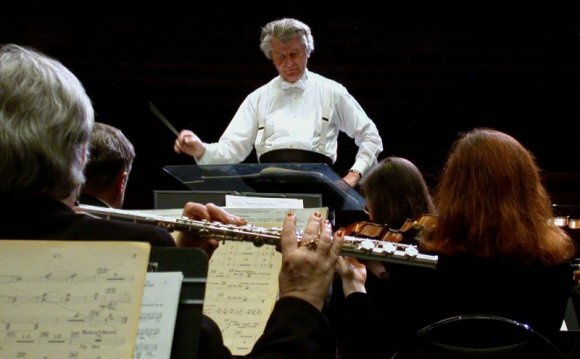 Musicians commonly use the term "warhorse" to denote compositions that through familiarity and frequent performance, earn a special place in the hearts of the concert-going public. These works are perennial audience favorites comprising a substantial portion of the standard repertoire; specifically, works that music lovers never tire of hearing. In response to the enthusiastic reception of the Navy Band's Overtures and Finales compact disc recording of 2003, Captain Ralph M. Gambone has assembled a new collection of excellent transcriptions to highlight a few notable examples of these orchestral favorites. With two exceptions, all of the warhorses on this disc are associated with opera and no doubt derive their familiarity from entering society's consciousness at a time when opera was at the height of its importance as entertainment in Western civilization. It is notable that all the transcriptions featured in this recording date from the first decades of the 20th century. This period marked the height of the concert band's popularity with the general public and coincides with the 1925 Congressional chartering of the United States Navy Band. The disc opens with one of two works by light opera composer Franz von Suppé (1819-1895). Suppé was of Belgian descent but lived and worked for most of his creative life in Vienna. A celebrated composer, he produced over 30 operas and hundreds of other light musical and stage compositions. Unfortunately, the passage of time has been unkind to Suppé as his complete works are rarely performed. Ironically, his now obscure catalogue produced two of symphonic music's greatest warhorses: the overtures from the operettas Light Cavalry (1866) and Poet and Peasant (1846). The works which contain these overtures, like the bulk of his output, have all but disappeared. Although referred to as operettas, they combine elements of musicals, comic farces and stage plays. The genre was wildly popular during the 19th century but fell by the wayside as grand opera and musical theater evolved in independent directions. The overture from German composer Carl Maria von Weber's (1786-1826) last opera Oberon (1826) illustrates his influence as an early champion of German Romanticism. A contemporary of Beethoven, Weber's notions of orchestration and the use of tone color had wide-ranging influence on later German Romantics. Oberon was written on commission as an "English" opera for premier in London's Covent Garden opera house. A frail man for all of his short life, Weber's trip to England, as well as the great energy he expended in composing, rehearsing and producing the work, had disastrous effects upon his health. Unfortunately, the exertion hastened Weber's decline and he died in bed from tuberculosis shortly after the successful premier. Two of Italy's greatest opera composers have been included in this recording. First, we hear Gioacchino Rossini's (1792-1868) overture to The Italian Girl in Algiers (1813). Rossini, born into a musical family, composed over 30 operas during his lifetime. Curiously, though he lived to be 76, he ceased writing opera at age 37. Although Rossini composed his first comic opera at age 18, it is this one, written three years later, that is considered his first mature work in the style. Rumored to have been written in only two and a half weeks, it was his first work to garner international recognition. The other Italian represented, Giuseppe Verdi (1813-1901), is considered by many to be the greatest opera composer in history. Greatly renowned in his lifetime, Verdi wrote The Force of Destiny (1862) for a commission received from the Imperial Theater at St. Petersburg, Russia. Considered the last opera of the composer's middle period, Verdi's output diminished greatly after the completion of The Force of Destiny, marking the end of the most prolific portion of his composing life. Frenchman Paul Dukas (1865-1935) spent the bulk of his working life as a music critic, composition teacher and orchestrator. Despite his various other musical activities, he managed to compose a substantial body of musical works. Regrettably, he was also highly self-critical and subsequently destroyed a great deal of his own output. The Sorcerer's Apprentice (1897) is his best known composition. Written only a year after his first symphony, some musicologists believe it was originally intended as a scherzo movement for the earlier work. Highly programmatic in nature, the piece depicts the frantic misadventures of a young sorcerer's apprentice in his master's studio. Based on a Goethe poem, the work has been forever immortalized both in Walt Disney's 1940 animated feature Fantasia and again in the more recent Fantasia 2000. "There's No One Quite Like Grandma" was a number one hit single by Stockport-based primary school choir St Winifred's School Choir from 27 December 1980 to 3 January 1981. It was written by Gordon Lorenz.